Answer: That’s a good question, the answer to which goes back to historical times. Fact is, the start date of the year differs from culture to culture. There are some 40 different calendars in use today around the globe. China, for example, celebrates this new year February 18th. Western society utilizes the “Gregorian Calendar,” which was decreed by Pope Gregory (with the help of his Jesuit astronomers) in 1582 AD. It was a modified version of the “Julian Calendar,” established by Julius Caesar in 45 BC. Before that, the year began on the date of the Winter Solstice (Dec 22nd). 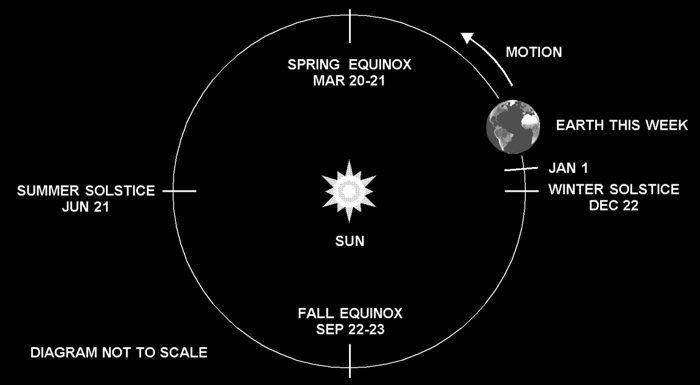 That was a logical date, since it represents the start of Winter (at least north of the equator), and an extreme point in the Sun’s cycle of motion through the sky. Of course, whatever date one chooses to start the year, a year is defined as the amount of time it takes Earth to complete one orbit around the Sun. The shift from Dec 22nd to January 1st was an arbitrary choice made by Julius Caesar. Some historians say his choice was motivated by political or religious concerns — we don’t really know for sure. Bottom line … it was arbitrary. So have a happy new year, whenever you start it.